Home > News > News > Tony Bennett & Marie Osmond! Tony Bennett & Marie Osmond! We’ve just added two more exciting performers to our 2011 line-up … Tony Bennett and Marie Osmond! 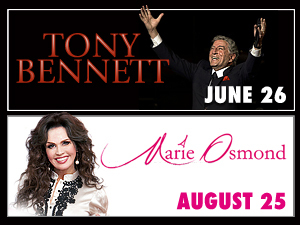 * Tony Bennett – Sunday, June 26 at 7:00 p.m.
* Marie Osmond – Thursday, August 25 at 8:00 p.m.
Tickets to these two concerts are sure to sell out quickly. Consider becoming an AMT Member to purchase tickets before the general public! Click here to learn more about Membership.